Mistletone very proudly presents “A Night With Uncle Jack”; a celebratory event with Uncle Jack Charles and a host of surprise / special guests from throughout his brilliant career. MELBOURNE: Tuesday September 6 at Trades Hall Council. Tickets on sale now from Oztix. CASTLEMAINE: Friday September 9 at Old Castlemaine Gaol. Tickets on sale now from Try Booking. 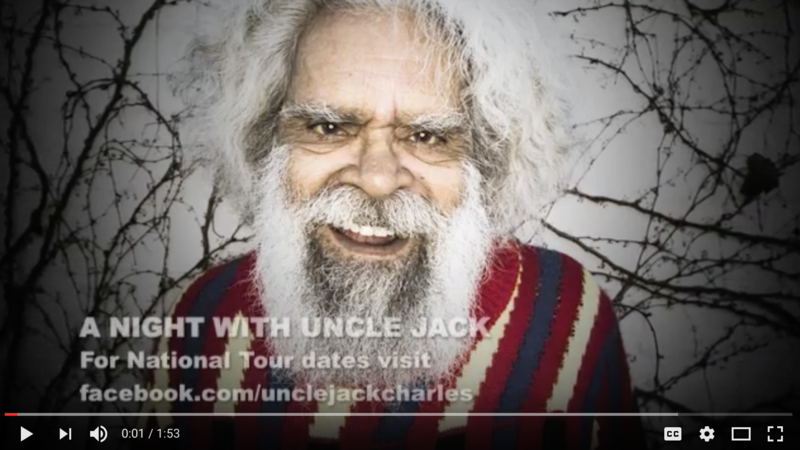 National treasure, award-winning actor, Aboriginal elder and activist Uncle Jack Charles will celebrate his longevity (73 years and counting) in the warm-hearted and freewheeling style he’s known and loved for, at “A Night With Uncle Jack” on Tuesday, September 6 at Melbourne’s historic Trades Hall Council. “A Night With Uncle Jack” will also come to Castlemaine’s Old Gaol on Friday, September 9. Uncle Jack will be joined by a host of special guests (many of whom will be surprise guests, to add to the party atmosphere) with musical performances and intimate story telling by the luminaries he’s worked with in film, theatre and television throughout his long and storied career. Acknowledged as the grandfather of Aboriginal theatre in Australia, Uncle Jack co-founded the first Aboriginal theatre company Nindethana in 1972. His acting career spans over six decades and includes roles in The Chant of Jimmie Blacksmith, Bedevil, Ben Hall and The Marriage of Figaro, Jack Charles v The Crown and more recently, Wolf Creek 3, Rake, Black Comedy, PAN and Cleverman. Uncle Jack was the subject of Amiel Courtin-Wilson’s award-winning documentary Bastardy, and was awarded the prestigious Tudawali Award at the Message Sticks Festival in 2009, honouring his lifetime contribution to Indigenous media. He was also recipient of a Green Room Lifetime Achievement Award in 2014. Having sold out 5 x warmup shows at Melbourne’s Curtin Bandroom, “A Night With Uncle Jack” will feature Uncle Jack talking and sharing stories in his inimitably entertaining style (and picking up his guitar for a song or two). The evening will be hosted by respected broadcaster Namila Benson and will feature many special guests and surprises on the night.